Anyone who spends a lot of time road tripping has likely seen a road train, a semi truck with more than one trailer behind it. They only receive so much use here in the United States since they are difficult and dangerous to drive. Plus, they're usually limited to just two trailers. If you want to see the really big road trains, you need to head south. A lot farther south. Australia is the birthplace of the road train, where they first appeared in the Flinders Range of South Australia in the mid 1800s, pulled behind traction engines, giving them a much more train-like appearance. Today, Australia still uses more road trains than the rest of the world combined—and for good reason. Australian roads are some of the longest and most desolate in the world. The overwhelming number of consumer cars and trucks we manufacture today are not capable of traveling between service stations in many parts of Australia on a single tank of gas. If you don't plan carefully, you WILL get stranded. It's generally just a much better idea to fly wherever you're going. (Which most people do.) If you do decide to road-trip, though, you'll spend ages on the road without seeing anyone, followed by a massive road train almost knocking you off the road with the wind from its passage. 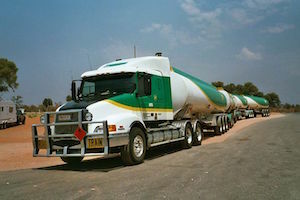 While dangerous, these cost-effective road trains have been vital to the development of many remote Australian regions. When it comes to getting into space, rockets are pretty much staircases at best. More like ladders, really. 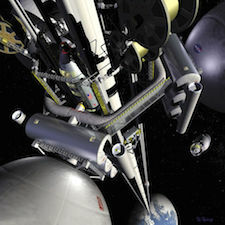 A space elevator is, essentially, a long cable—anchored at the equator, extending out into orbit. It works sort of like when you spin while holding a rope, and the rope is suspended above the ground by centrifugal force. (Or is it centripetal? I can never remember.) It’s not quite the same, of course, since it has to have a counterweight at the end, along with several other requirements. So why aren’t we using them now? Well, because we don’t have a strong enough cable. 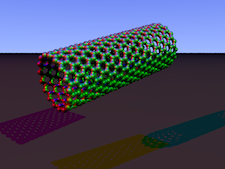 People keep bringing up carbon nanotubes as an option, but since we don’t have those yet, we just can’t build it. The space elevator would be more than possible on other, smaller objects in the Solar System. We could build a space elevator on the moon with ordinary Kevlar. Space elevators aren’t the only ideas for getting to space without rockets. Other ideas are floating out there, ranging from rocket sleds (which does actually involve rockets, but in a much more affordable manner) to skyhooks, which resemble something that a mad scientist, a six year old, and an engineer would design together if asked to create the nuttiest amusement park ride ever, all while hooked to caffeine IV drips. 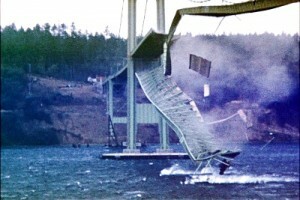 The Tacoma Narrows Bridge collapse is one of the best known architectural failures in modern history, and it is used as a lesson by everyone, from architects and civil engineers to insurance agents. Built in 1940 across the Tacoma Narrows in Washington State, the suspension bridge lasted less than a year before collapsing. The only casualty was a dog stuck in a car. Due to a very tight budget, the bridge was constructed with lightweight girders, as per the lowest bid design. (In my work, that Tacoma Narrows lesson is one of the many reasons I don’t just go for the lowest bid). During construction, the bridge’s thin design, low weight, and less-than-durable construction resulted in frequent vibrations and shaking whenever the wind picked up. It got so bad that the workers nicknamed it Galloping Gertie. Not exactly a trust-inspiring name. The bridge began undergoing severe oscillations (or, to be a bit less technical about things: the bridge shook itself to bits) under heavy winds on November 7th, 1940. I won’t go in depth on the science behind the collapse; you can find that easy enough. I’m more interested in what lessons it gives us about ignoring nature. For all the amazing things mankind has done, we still need to respect nature or it will come back to bite us. All of our technology and inventiveness allows us to stand up to nature, but push it around? Not a chance. We need to foster a design philosophy that promotes working with nature, not against it. This sounds like hippy talk, I know, but it’s nothing new. Heck, the idea goes back millennia. Look at any number of cultures that lived in hot climates—high ceilings, big windows, light colored paint. Cultures that live with heavy rain? You build your foundations strong, angle your roof, and pick your building site really carefully. Why’d I decide to blog about Tacoma Narrows, when so many people already use it as a lesson? Well, I think some people missed that one—like my son-in-law, who decided to have his shed built by the cheapest contractor: at the edge of a hill, with no real foundation to speak of. He’s going to be picking his tools out of the stream for weeks. The way I figure it, most billionaires are just investors: they’re simply using money to make more money. It’s not real exciting, but if you really want to be rich that bad, I guess it works. A few billionaires are more interesting to me, though—guys like Bill Gates and Elon Musk, who actually get involved in producing new things. Elon Musk is especially noteworthy right now. He’s started a private space corporation (SpaceX), co-founded Tesla Motors, and most recently is pushing for the Hyperloop. 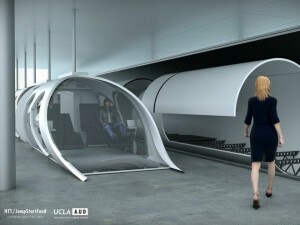 The Hyperloop is a conceptual transportation system that would be able to move passengers at speeds twice, or more, of a passenger aircraft. Essentially, it’s a high speed train in a sealed tunnel with most of the air pumped out, letting it speed unhindered by air resistance, track friction, weather, or any of the difficulties facing other modes of high-speed transportation. This thing could potentially hit thousands of miles an hour (depending on how low they can keep the pressure in the tube; that’s the big limiting factor). Rather than using maglev (magnetic levitation) or wheels, the train would float on air rails, very similarly to how an air hockey table works, and it would be accelerated by linear induction motors. This concept isn’t new. The idea of vacuum trains has been around for decades. This is one of the first attempts to really build one, though. While all of the initial design work was done by Musk’s engineers, he then took the unusual step of releasing all of the designs and plans. All of them. He turned it into an open source project. Most of the current work on the project is by a group of engineers called Hyperloop Transportation Technologies. (The old saw about engineers getting to name companies holds true here). That’s not to say that it doesn’t face plenty of troubles of its own. They’ve still got to figure out how to handle earthquakes, any number of technical issues, and even zoning issues. But I feel confident saying that we’ll get to see this fly one day.